This example works perfectly for me but how to I clear the message? What do you mean by clearing the message? I am working in 10g (10.1.3.5) my global af:message is embedded in the page. I can programmatically set the message just as you did above but I can not find a way to clear it. Thanx for the tutorial, I’m wondering if there is a way to customize the information message box to specific width and height, as you can see in pop-up global message above the height of the popup is big, I want to make it more smaller and center in the screen. Unfortunately I have no idea about that. This question has been discussed in OTN by Chris Muir who is an Oracle ADF Product Manager. but it seems there is no answer until now. I did not face this problem, and works perfectly with me. In my case if i change any property of af:message tag. jsf page not display correctly on browser. Hello Manish, What is your Jdeveloper version? 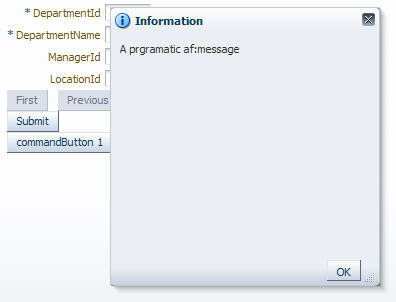 can i handle the ok button on inside the af message? You can use inline dialog, and handle the outcome from the dialog event. 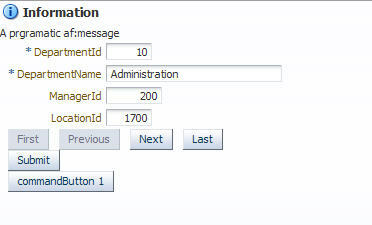 check Example 15–2 Handler for dialogEvent That Deletes an Item, in web user interface guide.